Which are the top 10 IoT boards for 2019? Before we delve into the answer to this question, let’s look at what IoT is all about? Internet of Things, or IoT as it’s more commonly known, refers to a network of devices from vehicles to home appliances, including those that comprise electronics and software products and the connectivity that allows these things to interact and exchange data. So IoT includes taking Internet connectivity beyond standard devices, such as desktops, laptops, smartphones and tablets, to any object, including the everyday non-internet-enabled kind. Fitted with IoT technology, not only can these devices communicate and interact with each other, but they can also be remotely monitored and controlled. Indeed, if you look around your home or your car/ work environment, you’ll agree that IoT technology is making our worlds a whole lot smarter. The all pervasive IoT is today being used for home automation, manufacturing and agriculture, and medical care among other things. And since IoT essentially means connecting things to the internet, there’s ample scope to carry out IoT home improvement projects or fun IoT experiments! And that’s when you will need to check out the best IoT boards available in the market. IoT boards are basically hardware platforms that are commonly used to build prototypes of manufacturer’s ideas. 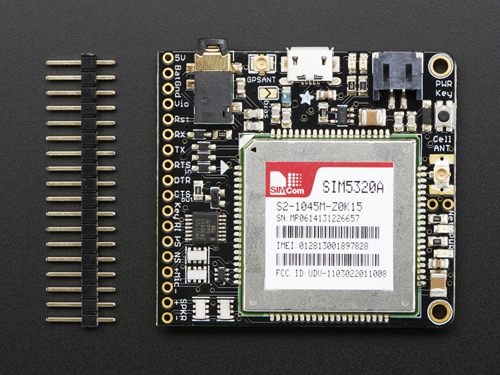 There’s a wide variety on offer and one can choose from between microcontroller-based boards, Single-Board Computers (SBC) or even cellular-enabled IoT boards. Arduino UNO is an open-source microcontroller board based on the Microchip ATmega328P microcontroller and developed by the tech company Arduino. The board is equipped with sets of digital and analog input/output (I/O) pins that may be interfaced to various expansion boards (shields) and other circuits. It has 14 digital input/output pins, 6 analog inputs, a 16 MHz quartz crystal, a USB connection, a power jack, an ICSP header and a reset button. Since it has everything required for supporting the microcontroller, one can simply connect it to a computer with a USB cable or power it with a AC-to-DC adapter or battery to get started. 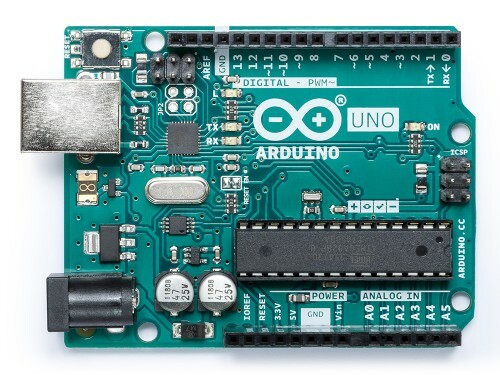 Advantages: Arduino Uno is easy to learn, has low costs, plus a wide array of sensors and several third-party libraries. There’s a large number of (online and free) resources that can be used with this IoT board. Disadvantages: When compared to Raspberry Pi, Arduino Uno needs some effort in order to carry out tasks such as scheduling and database storage. So Arduino is not a great choice if you need more processing power and memory. Arduino Uno projects: Arduino Uno is perfect for projects such as programming a temperature and humidity sensor, detecting motion with AC/ static electricity, controlling an automated soldering robotic arm and so on. 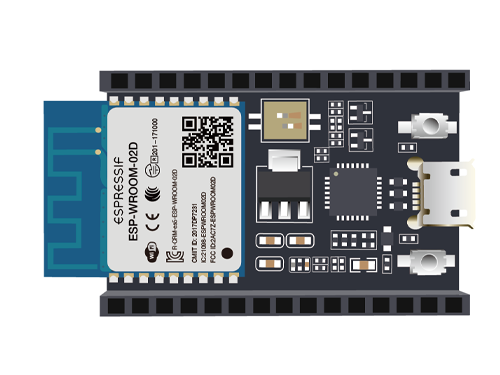 ESP8266 is a low-cost Wi-Fi microchip with full TCP/IP stack and microcontroller capability produced by Shanghai-based Chinese manufacturer Espressif Systems. It contains a built-in 32-bit low-power CPU, ROM and RAM. It is a complete and self-contained Wi-Fi network solution that can carry software applications as a stand-alone device or connected with a microcontroller (MCU). The module comes fitted with an AT Command firmware that can be used with any MCU via COM port. Fitted with a L106 32-bit RISC microprocessor core based on the Tensilica Xtensa Diamond Standard 106Micro running at 80 MHz, it has 16 GPIO pins. On the memory front, it has 32 KiB instruction RAM, 32 KiB instruction cache RAM, 80 KiB user-data RAM and 16 KiB ETS system-data RAM. Other features include WEP or WPA/WPA2 authentication. Advantages: The advantages of the ESP8266 include its low cost, reliability and easily availability in the market. Disadvantages: Until a while ago, most of its documentation was in Mandarin, although the emergence of the ESP8266 community in recent days has helped translate several details about programming. ESP8266 projects: Examples of ideal projects include tracking geolocation, building a wireless web server, putting pressure sensors on railway tracks to detect animal presence and set off an alarm (thus avoiding animal deaths on tracks), humidity and temperature monitoring and even making a personal assistant of your own (think along the lines of SIRI, Google Assistant, Alexa!). Adafruit FONA MiniGSM is an all-in-one cellular phone module that allows one to add voice, text, SMS and data to one’s project. This board allows one to connect with any global GSM network with a 2G SIM. It also needs a 3-5V microcontroller. Advantages: With an Adafruit FONA, one can make and receive voice calls from anywhere using a headset, send and receive SMS messages, send and receive GPRS data (TCP/IP, HTTP, etc.) and scan and receive FM radio broadcasts. Other advantages include buzzer vibrational motor control allowing noiseless notifications and AT command interface with “auto baud” detection. Disadvantages: It needs accessories such as a SIM Card, Lipoly Battery, MicroUSB cable for charging the battery and an external antenna. Also, not all SIM cards may work. Adafruit FONA projects: Ideal IoT projects are the GPS logging and marking ones as also the geofencing projects that send alerts when the board moves out of a marked area. Particle is a full-stack IoT device platform with device, connectivity hardware, cloud, and even SIMs for cellular products. This means that when you buy a Particle Electron, you get a cellular module, that allows you to connect with the Internet in over 120 countries, and it is accompanied by a Particle SIM card, a microcontroller, the input and output pins, antenna and USB cable, battery, buttons and LEDs. It has a 120MHz ARM Cortex M3 microcontroller, 1MB flash, 128KB RAM, RGB status LED, 30 mixed-signal GPIO and advanced peripherals plus an open source design. Advantages: It complies with any cellular standard and comes with 2G/3G connectivity, SIM card, a low-cost data plan, and some great software for making cellular-connected products. Since the Particle Electron is a pre-configured module, it is ready to connect to the internet straight out of the box. Disadvantages: Cellular connectivity entails license fees and typically, the Particle Electron Iot board is bigger, heavier, more expensive and power consuming than an Iot board that has Bluetooth low energy or Wi-Fi. Particle Electron projects: The ideal projects include making a GPS + Cellular tracker (to track kids or even valuable objects), monitoring remote sensors and making a high current alarm. 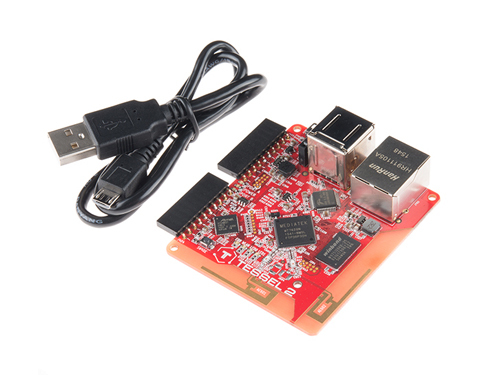 The BeagleBoard is a low-power open-source single-board computer produced by Texas Instruments in association with Digi-Key and Newark element14. It runs on Ångström, a Linux distribution and was built by a small team of engineers as an educational board that could be used in colleges around the world to teach open source hardware and software capabilities. In that sense, it is a lot like the Raspberry Pi. 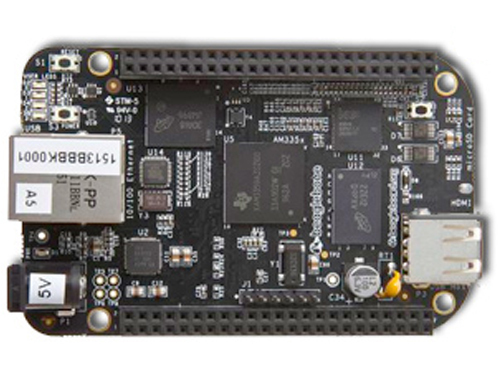 The BeagleBone Black’s features include 512MB DDR3 RAM, 4GB 8-bit eMMC on-board flash storage, 3D graphics accelerator, NEON floating-point accelerator and 2x PRU 32-bit microcontrollers. On the connectivity front, it has USB client for power & communications, a USB host, Ethernet, HDMI and 2x 46 pin headers. Advantages: The BeagleBoard, especially the BeagleBone Black version, is easy and inexpensive to set up and use. It consumes low power and thus needs no additional cooling or heat sinks. Plus the BeagleBone Black features 65 input and output pins and a huge number of supported interfaces, making it ideal for projects dealing with electronics. Moreover, there’s the PocketBeagle, which provides identical computing performance to BeagleBone Black along with 50 percent reduction in size, 75 percent reduction in weight and 40 percent cheaper purchase price. 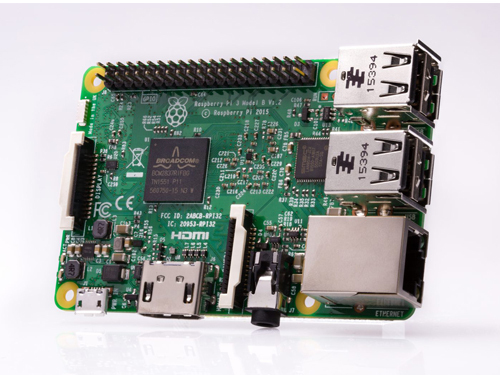 Disadvantages: The BeagleBoard is not the best bet for complex multimedia and Linux-based projects as it doesn’t have the graphical and audio capabilities that the Raspberry Pi has. BeagleBoard projects: BeagleBoard is ideal for beginners in electronics and programming. So projects that require reading from external sensors, commanding actuators (such as motors or light systems), and networking are simpler and more efficient with the BeagleBone Black than with a Raspberry Pi. An Allwinner based ARM board developed by FriendlyElec, NanoPi NEO Plus2 is rather tiny in that it is less than half the size of the Raspberry Pi. But that doesn’t stop it from offering impressive storage and performance. Its software is Ubuntu Core 16.04, which is a powerful distribution of the Linux OS. It uses Allwinner's 64-bit quad-core A53 SoC with hexa-core Mali450 GPU and also has 1GB DDR3 RAM, 8GB eMMC storage, 10/100/1000M Ethernet based on RTL8211E-VB-CG, WiFi, 4.0 dual mode Bluetooth and 1 MicroSD slot. 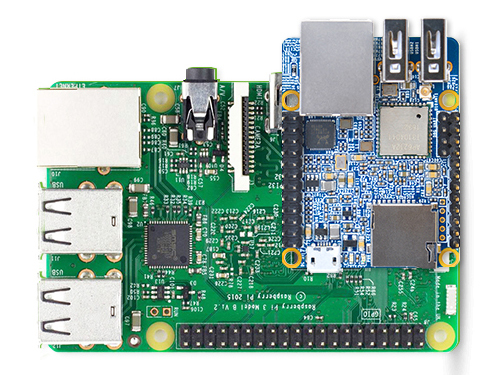 Advantages: When compared to the Raspberry Pi, the NanoPi NEO Plus2 comes equipped with gigabit Ethernet with 8 Gbits of eMMC storage and two USB ports. It is has a micro-USB for powering the device and despite being smaller in size, it has expandable memory thanks to its microSD slot. Its other advantages include its relatively low cost, high speed and high-performance computing. Disadvantages: It does not include an HDMI port and it is nowhere as close as the Raspberry Pi when it comes to assembling a fully functional desktop PC. It also doesn’t have a huge user base and consequently, doesn’t have the support of a community as large as the one that Raspberry Pi enjoys. NanoPi Neo Plus2 projects: It is ideal for projects involving small IoT appliances, particularly those that need high data throughput, high-speed data transmission and high performance. Developed in the United Kingdom by the Raspberry Pi Foundation to promote the teaching of basic computer science in schools and in developing countries, Raspberry Pi comprises a series of small single-board computers These SBCs run on Raspbian, a Debian-based computer operating system created for Raspberry Pi. 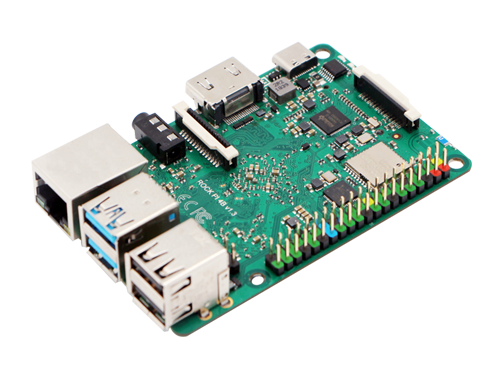 Powered by a Quad Core Broadcom BCM2837 64bit ARMv8 processor, the Pi 3 runs at 1.2 GHz, has an upgraded power system, four USB ports and an extendable ‘naked board’ design. Additional features include 10/100Mbps Ethernet, on-board wireless LAN, Bluetooth and HDMI plus composite video (PAL and NTSC) via 3.5 mm jack as video outputs. Advantages: Rather easy on the pocket in comparison to others in the market, Raspberry Pi allows one to install a fully fledged Operating System (OS) and use it as a computer on a day-to-day basis. Thanks to the Raspberry Pi’s GPIO (General Purpose Input Output pins), one can connect these pins to sensors and external components and interact with them using a language such as Python. This lets you create and prototype Internet of Things devices. 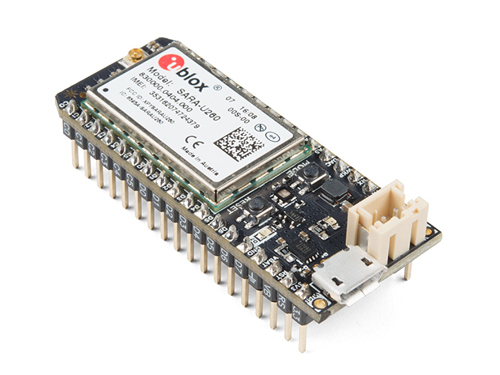 Moreover, the newer models (such as Raspberry Pi 3) have WiFi and bluetooth built in, which in turn helps one easily take projects into the wireless mode. Disadvantages: Given that there is no fuse protection, the Raspberry Pi board can get damaged if one connects pins incorrectly. It is also not as fast when it comes to CPU processing speed and it doesn’t have as much memory as a PC or a laptop. Plus, there is no built in analog to digital conversion on the GPIO pins like in the case of Arduino, leaving the user to get an ADC chip to work with analog signals for more accuracy. Raspberry Pi projects: One can host simple websites by using Raspberry Pi as a low-cost web server. You can also use it to create a captive portal for your guest Wi-Fi, as also for creating facial recognition projects and for building a Raspberry Pi powered robot or even a laptop! The Rock Pi 4 is a Rockchip RK3399 based Single Board Computer (SBC) by the company Radxa. It features a six core ARM processor and supports USB PD (Power Delivery) and Quality Control (QC) powering. Rock Pi 4 comes in two models, Model A and Model B with each model available in 1GB, 2GB or 4GB RAM options. It has a Gbit LAN for network, with dedicated bus and controller and it works without latency under heavy load network applications. The on board 802.11 ac WiFi offers 2.4G&5G WLAN connectivity and other features include Bluetooth 5.0, a USB 3.0 host and a USB 3.0 OTG port, each 5Gbps/s and working independently. Advantages: It boasts class-leading performance and low power consumption while also offering enhanced mechanical compatibility. It can run on Android and some Linux distributions. The 40-pin GPIO interface facilitates interfacing with a range inputs from buttons, switches, sensors, LEDs, and much more. Rock Pi enjoys the support of a strong community and has good documentation. Disadvantages: Rock Pi 4 supports USB PD, but USB PD adapters are still quite expensive, which doesn’t work in favour of this IoT board. Also, Ropck Pi 4 needs better tuning for image quality under Linux. RockPi 4 projects: Makers, IoT enthusiasts, hobbyists and PC DIY enthusiasts can find in it a competent and dependable platform for converting their ideas into reality. It is being hailed as a Raspberry Pi clone and can be used for pretty much all the projects that a Raspberry Pi is used for. Examples include using it as a low-cost web server, making captive portals for guest Wi-Fi and facial recognition projects. A robust IoT and robotics development platform, Tessel 2 allows one to tap the libraries of the Node.js web development framework so as to make a variety of useful devices within a short span of time. This primary processor of the Tessel 2 runs a very lightweight version of Linux called OpenWRT. Built to allow the fastest possible production, its USP is its plug and play modules and high-level APIs are its USP. One doesn’t have to set up and maintain a Linux system or track down pinout diagrams to wire up sensors here. Its specs include a 580MHz WiFi router system on chip, 64 MB of DDR2 RAM, 32 MB of flash storage, two high-speed USB 2.0 ports, a micro USB port, a 10/100 Ethernet port (RJ-45 jack) and a 48MHz ARM Cortex M0 microcontroller. Disadvantages: The Tessel 2 looks good but it is not as cost efficient as Raspberry Pi nor does it offer enough additional utility over the latter. Tessel 2 projects: Tessel 2 has two custom “module” ports from where one can add 10-pin modules like accelerometers, climate sensors, Infrared and more. Each module has several instructions and tutorials available online. From sensing to actuation to connecting with other devices, interacting with the physical world has been made really simple with Tessel 2. Ideal projects are those that include detecting ambient light, detecting humidity and temperature in the environment, playing and recording audio, connecting Tessel anywhere with support for mobile internet on a GSM based network and so on. The UDOO X86 ULTRA is a powerful x86 maker board and an Arduino 101-compatible platform, combined to make one board. The resulting board is ten times more powerful than a Raspberry Pi 3 and it can run most applications that one usually runs on a PC on a daily basis plus some 3D games. It supports Linux, Android, and Windows 10. Specs include upto 8GB dual channel RAM, a 2.56 GHz CPU with a 64 bit Quad core processor, three simultaneous screens (one HDMI and two MiniDP++), WiFi and Bluetooth 4.0. Advantages: It has a huge processing power, way more than most SBCs. Despite the small community, it is quite helpful and has quite a few good guides. 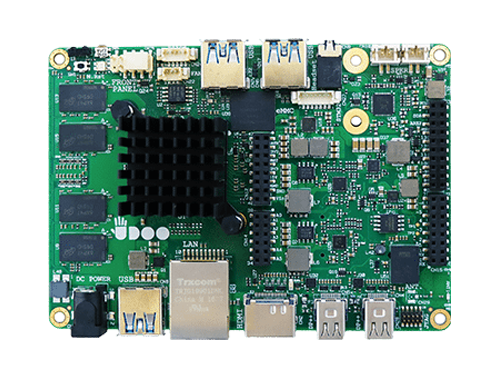 UDOO X86 ULTRA is fanless and energy efficient (taking up less than 11 watts at any given time), easy to set up, enjoys decent GPIO support and has great storage; it comes with 32GB eMMC (embedded MultiMediaCard, basically a built-in SSD). It also has great wired connectivity and media streaming potential. Disadvantages: It is quite expensive for an SBC and has poor wireless connectivity. Moreover, demanding games can not be played on the UDOO X86 ULTRA. UDOO X86 ULTRA projects: You can work on projects such as retrofitting (and thus upcycling) classic electronic items such as a vintage radio for the modern age by running it on Android; creating an ambient light system; or even making an UDOO X86 ULTRA-enhanced guitar - one that has MIDI and FX controls built into it. This blog is presented to you by YoungWonks. The leading coding program for kids and teens. YoungWonks offers instructor led one-on-one online classes and in-person classes with 4:1 student teacher ratio. Coding (Computer Programming) and Engineering Classes for Kids and Teens. Curriculum based on hands on robotics and game development projects.